Kyle Larson picked up the 5th last-place finish of his Monster Energy NASCAR Cup Series career in Sunday’s O’Reilly Auto Parts 500 at the Texas Motor Speedway when his #42 Credit One Bank Chevrolet was involved in a single-car accident after 147 of 334 laps. The finish, which came in Larson’s 190th series start, was his first since April 29, 2018 at Talladega, 33 races ago. 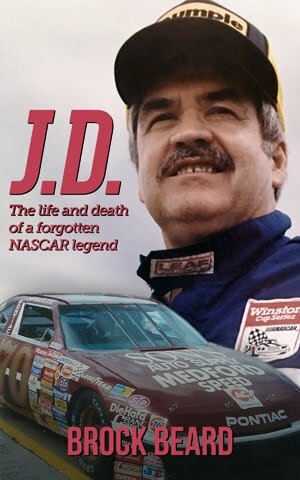 In the Cup Series last-place rankings, it was the 23rd for car #42, the 577th from a crash, and the 759th for Chevrolet. Across NASCAR’s top three rankings, it was the 34th for the #42, the 1,174th from a crash, and the 1,651st for Chevrolet. 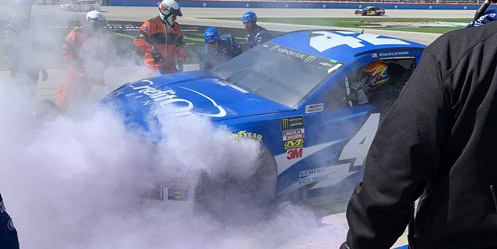 The image of Larson’s #42 Chevrolet careening off the walls on the final two corners of last year’s inaugural Roval race came to symbolize the season for both Larson and team. After a four-win season in 2017, Larson couldn’t quite find his way to victory lane last year, finishing 2nd six times – including both races at Bristol. A late wreck on the Roval threatened to end his Playoff bid, that is, until he passed the stalled #96 Toyota of Jeffrey Earnhardt in the final corner, bumping Jimmie Johnson from contention. 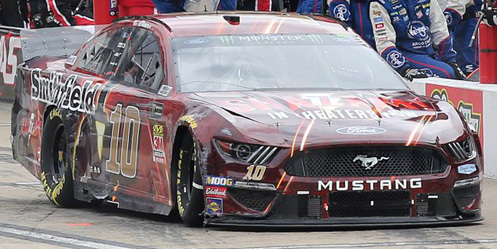 But a 12th at Dover, an 11th at Talladega, and a 3rd at Kansas weren’t quite enough to advance, and he settled for a 9th-place finish in points. This year, Larson has a new teammate in Kurt Busch and a new determination to return to victory lane. He began the year 7th in the Daytona 500, then dominated the following round in Atlanta, leading 142 laps only to be undone by a late pit road speeding penalty. Heading into Texas, Larson had just earned his season-worst finish at Martinsville, but had yet to finish lower than 18th at the checkered flag, ranking him 11th in the standings. The Fort Worth oval has not been kind to Larson. Coming into the race, he’d finished 23rd or worse in five of his eleven starts, including a pair of hard crashes in Turns 1 and 2 in both the fall of 2017 and spring of 2018, each yielding a 37th-place run. But he’d also finished 5th or better three times, including a runner-up finish to Jimmie Johnson in the spring of 2017. Larson began the weekend 28th in the opening practice and ran 24th in Round 1 of qualifying. He advanced to Round 2, only to time in just 22nd on the charts with a lap of 184.414mph (29.282 seconds). The team found speed in final practice, when the #42 jumped to 7th on the charts. Following the withdrawal earlier in the week of Obaika Racing’s #97 Chevrolet, the remaining 39 entrants all earned starting spots in the race. Starting shotgun on the field was Timmy Hill, set to make his first Cup start of the season. Driving Motorsports Business Management’s #66 Toyota previously run by Joey Gase (contrary to a graphics error by FOX Sports during the race broadcast), the car appeared to be the #66 run in Las Vegas and Fontana, though this time with the quarter-panels blank and the American Valor Foundation logo on the hood. On the first pace lap, Hill stopped near the first pit stall, then caught back up to the tail end of the pack. As he drove down the backstretch, both Ross Chastain in the #15 Rim Ryderz Chevrolet and the #77 Trophy Tractor Chevrolet of Garrett Smithley stopped on the inside, then also rejoined the grid ahead of Hill. It was on the second pace lap that two drivers fell to the rear for pre-race penalties: 24th-place Alex Bowman, sent to a backup #88 Llumar Chevrolet following an accident in qualifying, and 18th-place Ryan Newman, whose #6 Wyndham Rewards Ford twice failed pre-race inspection. Both Newman and Bowman fell back to the last cars on the outside lane before seven drivers fell behind them. Coming to the stripe, Newman was up to 32nd. In the row behind him were Parker Kligerman in the #96 Gaunt Brothers Racing Toyota inside Chastain’s #15, then Rick Ware Racing teammates Bayley Currey (#52 Trick Shot Penetrating Lubricant Chevrolet) and B.J. McLeod (#51 Jacob Companies Chevrolet), then Reed Sorenson (#27 Solomon Plumbing Chevrolet) and Smithley’s #77, and finally Hill. On the break, the tail end of the field uncoiled into single-file racing with Hill trying to track down Smithley for 38th. But Hill reported his car was tight, perhaps dragging something beneath the car, and he was losing touch with Smithley by the third circuit. Now reporting he was “getting beat bad off the corners,” Hill was told the leaders were gaining on him fast running the low lane. On Lap 16, race leader Jimmie Johnson caught Hill exiting Turn 4, but moments before he could lap him, the caution fell for Erik Jones’ spin in Turn 1. Under the yellow, Hill tried to get onto pit road, but ended up returning to the track. 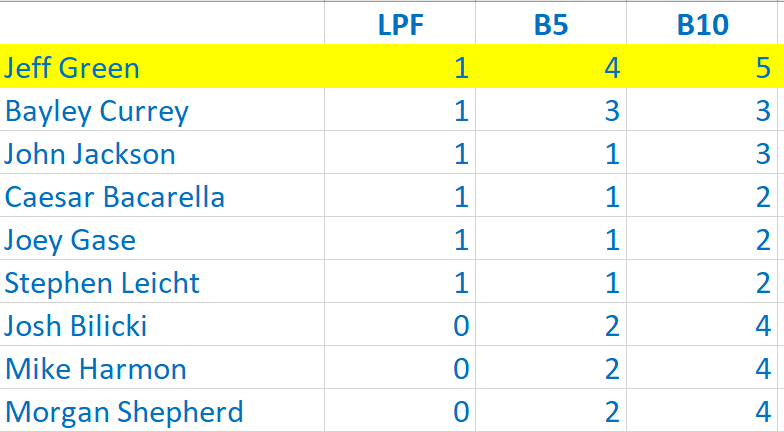 The one-lap delay lifted Hill to the 16th spot while David Ragan, Erik jones, Ryan Preece, and Parker Kligerman traded last place after their first caution-flag stops. When he came in, Hill beat out McLeod’s #51, dropping the Chevrolet to last. This didn’t last long as Hill pulled behind McLeod for the restart, the #51 lining up to the inside of 37th-place Sorenson in the #27. When the race restarted, Hill was again trailing by open track, and this time was caught and passed by Johnson on Lap 34. Hill moved to the high lane just short of the starting line, and from there struggled to find a spot in line among the faster traffic. Next to join the last-place battle was Corey LaJoie, whose #32 lost two laps with an unscheduled stop around Lap 43. LaJoie had smacked the wall under green, and had to pit to change tires and clear the fenders. The driver returned to the track, the spotter reporting no smoke from his machine, and the Ford was back underway. On Lap 50, LaJoie caught and passed both Chastain and Smithley in Turn 4, then cleared Hill off the corner, dropping the #66 back to last. Hill lost a third lap to Johnson on Lap 58. On Lap 67, Landon Cassill then took last when his #00 USFRA Chevrolet incurred an uncontrolled tire penalty on pit road, forcing him to make a pass-through penalty under green. The stop dropped him to three laps back, then a fourth by Lap 72. Like LaJoie, Cassill then chased down and passed Hill for 38th, clearing him down the backstretch on Lap 77. Fuel mileage then became an issue for Timmy Hill and the MBM team as the race neared the end of Stage 1. Someone on the crew reported Hill had eight-tenths of a gallon left in the tank, and the driver was told to save fuel the moment the stage-ending caution came out. Still, the #66 ran out of fuel, then coasted by himself down pit road on Lap 87. The car soon re-fired, and he returned on Lap 92 to get topped-off with fuel, still four laps down in last. When the race was about to restart, the LASTCAR battle took another intriguing turn. Brad Keselowski, one week after a dominant victory in Martinsville, was running 5th when his car stalled on pit road. The crew looked over the car, and the driver reported something broken in the rear end. 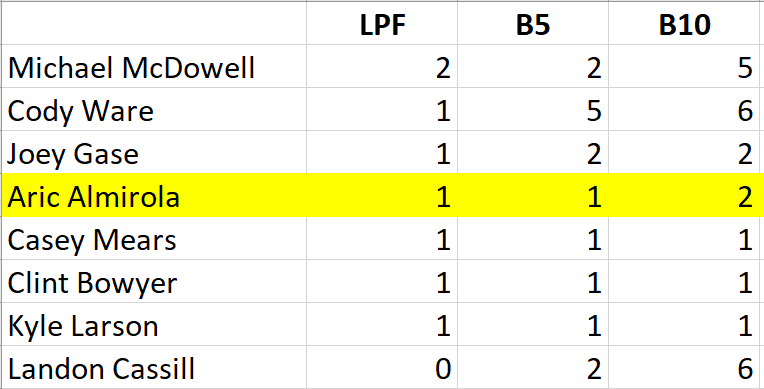 With the rest of the field still running within four laps of the leader, Keselowski dropped to last on Lap 96, putting the driver in real danger of his first Cup Series last-place finish in his 348th series start. Following the end of Kevin Harvick’s streak last May, Keselowski held the record for most Cup starts without a last-place run in a points race. On Lap 105, the #2 Miller Lite Ford was pushed behind the wall. Seconds later, on Lap 149, came Larson’s trouble. Headed through the same Turns 1 and 2 that had bit him twice before, his #42 Chevrolet didn’t turn at corner exit, and instead smashed into the outside wall with the right-front. Larson made it back to pit road, only for the crew to find a fire raging behind the destroyed right-front wheel. Larson climbed out, done for the day with crash damage. 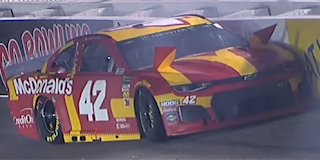 The crew pushed Larson’s car behind the wall on Lap 154, and the entry disappeared from RaceView on Lap 160. 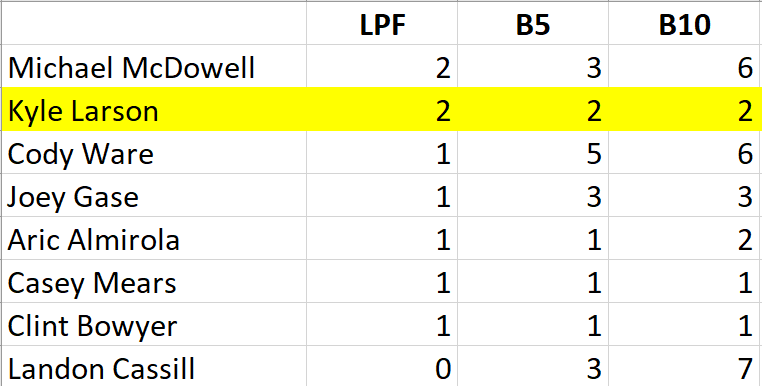 With a 51-lap gap between himself and Keselowski, the #2 would drop Larson to last if he reached Lap 204. 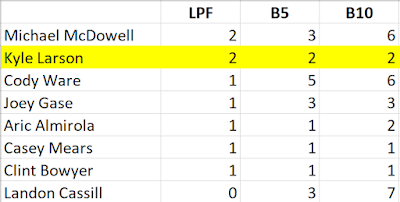 Keselowski did this, and Larson dropped to last as a result. Keselowski ultimately finished 36th, passing both Hill, who burned out the clutch past the halfway point, and Penske Racing teammate Ryan Blaney, whose 45 laps up front were followed by an overheating issue on his #12 Menards / Cardell Cabinetry Ford in the final stages. Rounding out the Bottom Five, 41 laps ahead of Keselowski, Bayley Currey finished 14 laps down to the leaders. Among the series’ underdogs, Michael McDowell turned in a fine performance, finishing 15th in Front Row Motorsports’ #34 Love’s Travel Stops / Winstar World Ford. 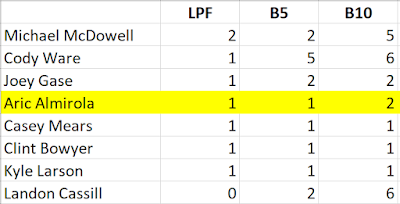 It was McDowell’s best Cup finish since this year’s Daytona 500, and ended the streak of five straight finishes of 24th or worse that followed it. McDowell’s best Texas finish – and his only other one inside the Top 20 – remains his 14th-place run in this same race last year. *This marked the first last-place finish for car #42 in a Cup Series race at Texas since November 2, 2008, when Juan Pablo Montoya’s #42 Texaco / Havoline Dodge was involved in a late-race wreck with David Gilliland after 262 laps of the Dickies 500. Gilliland was then parked as a result. Jeff Green picked up the 115th last-place finish of his NASCAR XFINITY Series career in Saturday’s My Bariatric Solutions 300 at the Texas Motor Speedway when his unsponsored #38 RSS Racing Chevrolet fell out with brake issues after 16 of 200 laps. The finish, which came in Green’s 519th series start, was his first of the year and first since November 10, 2018 at the ISM Raceway, seven races ago. In the XFINITY Series last-place rankings, it was the 15th for car #38, the 57th for brake trouble, and the 523rd for Chevrolet. Across NASCAR’s top three series, it was the 48th for the #38, the 161st from brake issues, and the 1,650th for Chevrolet. RSS Racing and its flagship #39 driven by Ryan Sieg have made a statement at the start of 2019, threatening to transcend from underdogs into weekly contenders for victory. 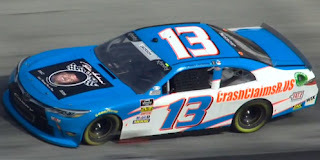 Sieg finished 10th in Saturday’s race, continuing a streak where he has finished no worse than 11th in any XFINITY race all season, and won Stage 2. This already eclipses Sieg’s season-best performance in terms of top-ten finishes, and his 9th-place rank in points matches his best overall championship rank of 9th at the end of 2016. While new backers, most recently CMR Construction & Roofing, have joined the #39 effort, and sponsors like The Boss and Woodshed joined teammate Josh Bilicki’s run in the #93, work still remains to fund the team’s third car with its most experienced driver - Jeff Green in the #38. As in years past, Green began the year with a fully-funded effort at Daytona, and rewarded the RSS Racing team with a strong 7th-place finish. But in the five races since, while he has not finished last, Green has run no better than 32nd, forced to “start-and-park” a blank black-painted Chevrolet. Saturday would see him do the same. Green began the weekend running just two laps in opening practice, the second jumping him to 23rd of 39 drivers. After not participating in Happy Hour, the car showed similar speed in Happy Hour, ranking 27th with a lap of 182.248mph (29.630 seconds). With 40 drivers for 38 spots, qualifying saw two underdog drivers miss the cut. Morgan Shepherd returned to the site of his hard practice crash last fall, but his #89 Visone RV Chevrolet could only manage the slowest completed lap in the session at 166.312mph (32.469 seconds), more than 1.2 seconds off the next-slowest car. Also sent home was Bayley Currey, withdrawn from Friday’s Truck Series race and unable to complete a qualifying lap in Rick Ware’s #17 on Saturday. 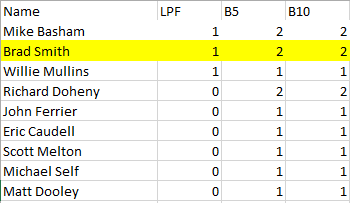 Both Currey and the #0 Trophy Tractor Chevrolet of Garrett Smithley did not post a time, and Smithley’s out-ranking of Currey in Owner Points left the #17 on the wrong side of the cut line. Smithley retained the 38th and final starting spot thanks to an unapproved adjustments penalty that kept him in the final spot. The same issue dropped from 24th Tommy Joe Martins in the #99 Diamond Gusset Jeans Toyota. Five other drivers, including Green, were also sent to the rear for missing the driver’s meeting: 20th-place Gray Gaulding (#08 GGPure.com / Flywheel Chevrolet), Timmy Hill (#13 Chris Kyle Memorial Benefity Toyota), Josh Williams (#36 Simcraft Chevrolet), and Ronnie Bassett, Jr. (#90 Bassett Gutters & More Chevrolet). An early spin by Jeremy Clements’ #51 RepairableVehicles.com Chevrolet on Lap 2 caused last place to change hands briefly, but just a few laps after the restart, Green had pulled the #38 ehind the wall, followed four laps later by Hill. Finishing 36th was Brad Keselowski, who finished inside the Bottom Five for the second-straight XFINITY Series start after a crash on Lap 66. Ray Black, Jr.’s day ended after the ensuing restart, when the #07 Isokern Fireplaces & Chimneys / Scuba life Chevrolet backed into the Turn 2 barrier. Rounding out the group was Cole Custer, winner at Texas last fall, whose #00 Jacob Companies Ford tangled with Brandon Jones on Lap 133. 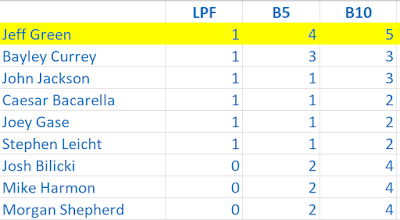 Custer and Black earned their first Bottom Fives of 2019. Many of the drivers who suffered pre-race penalties went on to score solid finishes. DGM Racing teammates Josh Williams and Ronnie Bassett, Jr. finished 14th and 15th, a career-best for each driver, with Bassett’s coming in just his second series start. Gaulding recovered to finish 21st, which while it was his second-worst finish of the season, has kept him 15th in points. Martins finished 19th, his second-straight top-twenty finish and season-best for 2019. 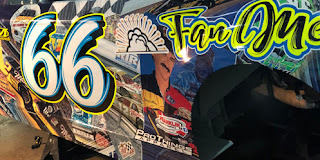 In addition, Brandon Brown – his rear decklid covered with the Twitter handles of 62 fans – went on to finish 17th, his sixth-straight finish of 18th or better in 2019. The still-unsponsored #86 Chevrolet holds 14th in the series standings, 141 points back of the lead held by Tyler Reddick. 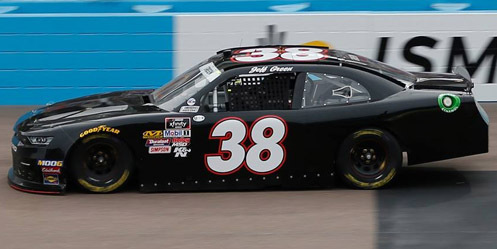 *This marked the first last-place finish for car #38 in an XFINITY Series race at Texas since November 4, 2006, when the late Jason Leffler lost the engine on his #38 Great Clips Chevrolet after 55 laps of the O’Reilly Challenge. *This was Green’s seventh last-place finish in an XFINITY Series race in Texas. There are 33 trucks entered for 32 spots, meaning one team will miss the show. Eight teams entered at Martinsville are not among them. UPDATE: Make that 34 entries woth the addition of the #1. Travis Kvapil finally made his 2019 debut with a 28th-place finish after early issues at Martinsville. Neither driver nor the Mark Beaver team are entered this week. UPDATE: The team is now entered and Bayley Currey will become the fifth driver to run all three races this weekend. Joe Nemechek’s team has two trucks entered this week, bringing back the #87 that was withdrawn at Martinsville. Nemechek himself will drive the flagship #8, taking the place of Austin Dillon, who ran 13th at Martinsville. The #87, which Nemechek was to drive last week, will instead go to Timmy Hill, who joins Kyle Busch, Garrett Smithley, Bayley Currey, and Ross Chastain in attempting all three Texas races this weekend. 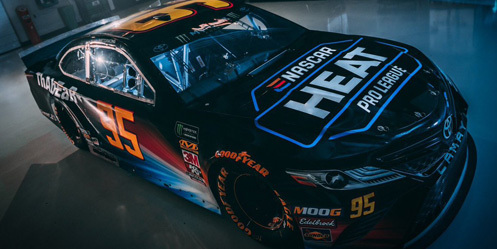 Hill qualified his new #56 team on time last week en route to a 21st-place finish. The Hill Motorsports effort, not entered this week, will next attempt Dover. Jennifer Jo Cobb returns to her #10 Chevrolet in Texas, one week after Juan Manuel Gonzalez failed to qualify for his series debut. At Martinsville, Spencer Davis picked up a 20th-place finish in his first start of 2019, but neither driver nor team are entered this week. Derek Kraus ran 18th in his own return at Martinsville, but the McAnally effort is also not among those entered. Also missing are Myatt Snider and ThorSport’s #27, 6th-place finishers last Saturday. Like NEMCO, Josh Reaume fields two trucks this week, including a second entry he withdrew at Martinsville. Reaume himself retakes the #33 from Daniel Sasnett, who is not entered after a 30th-place showing in his series debut. Jesse Iwuji returns for the first time since he reported for service immediately following the race in Las Vegas. He will again pilot the #34 Fueltrax Chevrolet he steered to a 26th-place finish that night. The Finley team returns to action for the first time since their hauler accident in Atlanta and subsequent withdrawal from Las Vegas. Behind the wheel is Garrett Smithley, a late driver swap with his friend Robby Lyons. If he qualifies, it will be Smithley’s first Truck Series start since July 7, 2016, when he finished 21st for SS-Green Light Racing. Tony Mrakovich’s scrappy underdogs are not among this week’s entrants following their DNQ in Martinsville. Angela Ruch rejoins the Truck Series circuit for a third time in 2019 following finishes of 8th and 16th for NEMCO Motorsports. This time around, she drives for Al Niece, taking the place of 24th-place Martinsville finisher Reid Wilson, who is not entered. KBM has not entered the #46 this week. 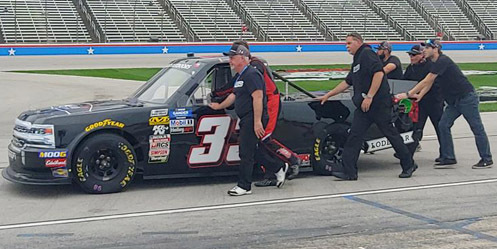 Raphael Lessard, also not entered, ran 14th in the truck last Saturday. While Kyle Busch remains the listed driver for Friday’s race, Greg Biffle tweeted on Wednesday night that he will also be practicing the #51 Toyota in the lead-up to the race. Biffle won the 2000 race at Texas from the pole during his start with Jack Roush. UPDATE: On Thursday came news that Biffle will drive the KBM #51 when the Truck Series returns to Texas this June. Anthony Alfredo returns to action this week, taking the place of team part-owner David Gilliland, 12th in Martinsville. Alfredo carries sponsorship from Ceco Building Systems and the Friends of Jaclyn Foundation, and will have driven each of DGR-Crosley’s three trucks in 2019. D.J. Copp’s season-long tribute to the ailing Mike Mittler will not make a stop this weekend in Texas, one week after Dawson Cram failed to qualify his own #63 machine. 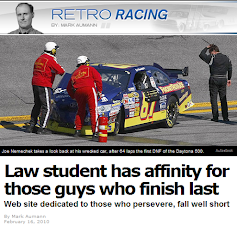 The Jacob Wallace effort is also not among the entered after they withdrew at Martinsville. Austin Theriault earned a 22nd-place finish at Martinsville, but neither driver nor team are among those in Texas. Rejoining the circuit is Jesse Little and the JJL Racing team, back in action for the first time since a season-best 19th in Las Vegas. Parker FiberNet is the listed sponsor of the #97 Ford. There are 40 drivers entered for 38 spots in Saturday’s return of the XFINITY Series, meaning that two teams will miss the show. Depending on weather, the battle for the final two spots could come down to two small teams and two new fully-funded rides. Jeb Burton moves from last week’s Cup effort for Rick Ware Racing into the XFINITY team from JR Motorsports. Burton, sponsored by longtime family backer State Water Heaters, eyes his first XFINITY start since last summer at Chicagoland, and takes over for Ryan Preece, 8th the last time out in Fontana. Fresh off a dominant win in Martinsville, Brad Keselowski and the #12 team are back for their first XFINITY race since a frustrating roof hatch issue in the Daytona opener. Keselowski’s two wins and only pole in the series at Texas have come in the fall race. He finished last in the spring race in 2007. For the first time, brothers Timmy and Tyler Hill will have the chance to race against each other in a NASCAR national touring series race. Tyler takes Timmy’s seat in the #66 while Timmy takes John Jackson’s ride in the #13. 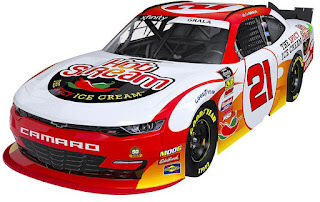 As announced in February, Kaz Grala has landed a part-time XFINITY schedule with Richard Childress Racing, which brings back RCR’s #21 for the first time since Daniel Hemric closed out 2018 at Homestead. Grala reunites with dessert maker Hot Scream, which backed some of the driver’s most recent starts with Fury Race Cars LLC. The upstart Fury team has yet to make a race attempt in 2019. Also returning to action is Jeffrey Earnhardt and his omnipresent sponsors iK9 and Xtreme Concepts, Inc. The sponsors will back the new #81 Toyota Supra under the XCI Racing banner, a car fielded in partnership with Joe Gibbs Racing, and will also attempt some Cup races this year. Earnhardt, who ran the season’s first two rounds in Gibbs’ #18 with a season-best 6th in Atlanta, looks to give car #81 its first XFINITY start since November 12, 2012, when Jason Bowles finished 29th at Homestead. Ronnie Basset, Jr. returns for the first time since his debut at the ISM Raceway as driver of Mario Gosselin’s #90 Chevrolet, sponsored by Bassett Gutters and More. 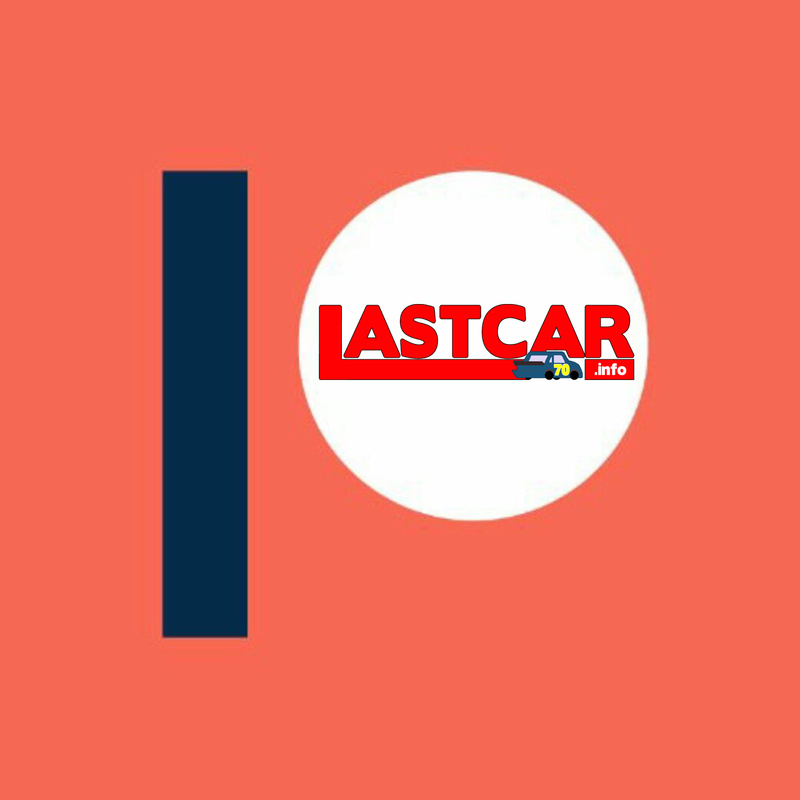 Bassett hopes for a smoother weekend after crashing out in Phoenix and driving a backup car, and the #90 team looks to bounce back after having to park a Jimmy Means Racing backup in Fontana. 2018 Last-Place Finisher: Martin Truex, Jr. There are 40 drivers entered for 40 spots this week, setting up what could be the first full Cup Series field since the Daytona 500 after five straight fields of 38 or fewer starters. UPDATE: Make that six straight as the #97 has withdrawn. Reed Sorenson returns for his third Cup Series start of the season and second in three rounds as driver of Jay Robinson’s #27 Chevrolet. The team, which last appeared at Fontana, has new sponsorship from Soloman Plumbing. On Friday, B.J. McLeod was swapped into the #51 for the first time since Daytona, taking the place of Cody Ware. Bayley Currey returns to the Cup Series for the first time since his series debut at the ISM Raceway earlier this month. He takes the place of Jeb Burton, who exited early with brake issues and finished 35th in Martinsville. Currey will also run in Saturday’s XFINITY race in Ware’s #17 Chevrolet. Carl Long has brought his Cup car along with his XFINITY effort, looking to start the race that NASCAR’s sealed engine rule prevented him from running last fall. 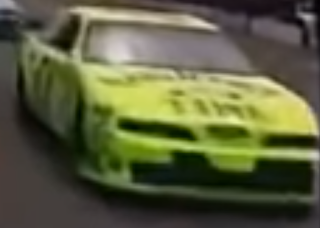 Then, as now, Timmy Hill is the driver, taking the place of Joey Gase, 35th his last time out at Fontana. Like Timmy Hill, Garrett Smithley rounds out his triple-header weekend with sponsorship from Trophy Tractor on the Spire #77 Chevrolet. Smithley takes the place of D.J. Kennington, who ran 32nd at Martinsville. Parker Kligerman and the Gaunt Brothers rejoin the Cup circuit for the first time since their 31st-place showing in Las Vegas. Kligerman’s third and most recent Cup start at the track came last fall, when he ran 31st. In a Chevrolet, not the Toyota from their Daytona press conference, Victor Obaika’s team seeks to make their season debut at the same track they ran last November. 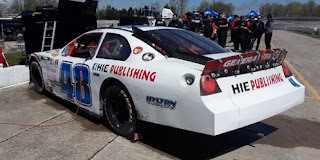 No driver was yet listed at the time of this writing, though David Starr, their pilot here last fall, will be competing for Jimmy Means in Saturday’s XFINITY race. UPDATE: The team has withdrawn as of Thursday. 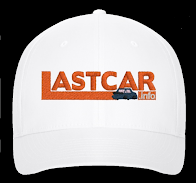 This day in LASTCAR History (March 28, 1987): Mark Martin picks up the first last-place finish of his NASCAR XFINITY Series career in the Country Squire 200. Making just his fifth series start, Martin started 29th in the #31 Fat Boys Bar-B-Q Ford fielded by Bruce Lawmaster, but fell out after just six laps with a broken oil pump. Martin would score just five last-place finishes in his XFINITY career, the last of which on October 3, 1998 at Charlotte.